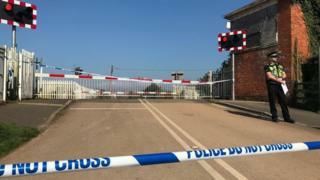 A 23-year-old man has been killed after a train crashed into a car on a level crossing in Devon. It happened at Stoke Canon between Exeter St Davids and Tiverton Parkway at about 06:00 GMT, Great Western Railway (GWR) said. Services running between Exeter and Tiverton may be cancelled or delayed, with disruption expected until about 20:00 GMT. GWR customers are able to use their tickets on local Stagecoach and First buses. "Officers continue to make inquiries to establish the full circumstances leading to the vehicle and man being struck by a train," BTP said. "Following this incident, three further incidents were brought to the attention of officers within the proximity of Stoke Canon. "This includes a train striking objects at Newton St Cyres and at Crannaford, as well as a line side fire at Eggesford. "All four incidents are being treated as linked, although at this time officers are not tracing anyone else in connection." The Rail Accident Investigation Branch and the Independent Office for Police Conduct have been informed.